Deep Sea Divers Den has operated from Cairns for over 25 years, making them one of the longest established diving & snorkelling companies in the area. Their training facilities are under one roof, which is one of the many reasons they have also earned their PADI 5 star Instructor Development Centre status. Deep Sea Divers Den's friendly and personalized service make it one of the best learn to dive courses available in Cairns. They employ many bilingual PADI diving instructors with English, German and Japanese courses available. The first 2 days of your course are spent learning the theory behind diving and learning new skills in the confined waters of their diver training pool. This is followed by a 2 day 1 night liveaboard trip to the outer reef where you will do your 4 training dives and 1 pleasure dive. 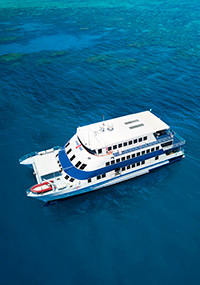 The live aboard vessel takes up to 48 passengers onboard and is permanently moored on the Outer Reef with a transfer vessel transferring passengers back and forth each day. There are 2 types of accommodation onboard: Double with ensuite (1 x double bed) and twin with ensuite (2 x single beds). 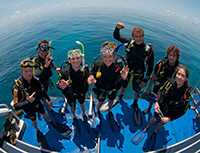 Day 1: The Deep Sea Divers Den bus will pick you up from your Cairns city accommodation at around 8:45am. You will spend the day learning theory & various skills in the pool. Your day should finish around 5pm when you will be dropped back to your Cairns city accommodation. 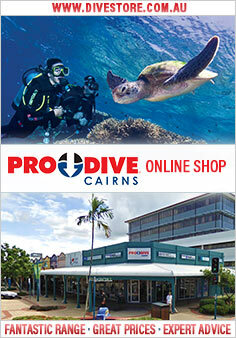 Day 2: The Deep Sea Divers Den bus will pick you up from your Cairns city accommodation at around 8:45am. Again, you will spend the day finishing the theory & various skills in the pool. Please note that on days 1 & 2 meals, accommodation and your dive medical are not included. Day 3: The Deep Sea Divers Den bus will pick you up from your Cairns city accommodation at around 7:30am. You will be transferred to the outer reef aboard SeaQuest and do your first 2 training dives. At 2:30pm you will be transferred over to the live aboard vessel where you will spend the night. Lunch, dinner and accommodation included. Day 4: Two further training dives with your instructor, followed by your PADI Open Water diver certification! You will now have the opportunity to do a pleasure dive before being transferred back onto ReefQuest for your transfer back to Cairns. You will arrive in Cairns at around 5pm for your transfer back to your Cairns city accommodation. Some medical conditions may prevent you from diving. You will be required to obtain a dive medical certificate prior to starting the course if you answer 'yes' to any of the questions on the medical declaration, this must be valid within 90 days of starting the course. More than 48 hours before course/trip commencement date: 10% of course/trip fee. No refunds are given within 48 hour's notice. This includes factors such as medical problems, airline strikes and weather, etc.